Are you switching over to compact fluorescent light bulbs at your home or business? There is a huge debate going on about the switchover to CFLs and with this story making the rounds, it seems like a good time to tackle some of the myths and truths about these energy saving devices. Truth: CFLs contain Mercury. Mercury is present on the inside surface of the glass used to make the bulbs. Myth: The amount of Mercury in CFLs is dangerous if released into the home via a broken bulb. Although it has been found that Mercury molecules can indeed be released into the home at higher levels than are recommended by the EPA, this can only happen if the broken bulb is not cleaned up or disposed of properly. Please see cleanup instructions below. Truth: Following proper cleanup and disposal procedures is essential to being safe from injuries from a broken CFL. Myth: You need to hire a professional cleaning crew to dispose of one broken CFL bulb. 1. Clear the room of people and pets. 2. Turn off the air conditioning or other ventilation system. 3. Air out the room by opening doors and/or windows for 5-10 minutes. 1. Use the cardboard or stiff paper to scoop up fragments and powder and place them in the glass jar or plastic bag. 2. Use the tape to pick up any remaining tiny pieces or particles of debris and put it in the jar or bag. 3. Wipe down the area thoroughly with damp paper towels or wipes and put these in the jar or bag also. 4. DO NOT VACUUM—unless the broken pieces are in carpeting. If you have to vacuum, try to use only the hose. Wipe down the vacuum and dispose of the vacuum bag outside immediately after. Remember that many vacuums distribute tiny particulates into the air when they are picking up larger items. Do not let Mercury get into your indoor air any more than necessary! 1. Take the jar or bag of debris and put it in your outside trash container for soonest pickup. If your state requires you to take CFLs to a recycling center, take it there. Do not keep the material in your household trash. Mercury vapor is not stopped by the plastic bag and could continue leaching into your indoor environment. The total amount of Mercury in a CFL is about 5 milligrams, about the size of the period at the end of this sentence. In comparison, a Mercury thermometer (hope you already got rid of those!) contains about 500 milligrams of Mercury and we used to all own those without worrying about it. There is no doubt that Mercury is poisonous, that you should be careful with broken glass, and that necrotizing fasciitis is gross. 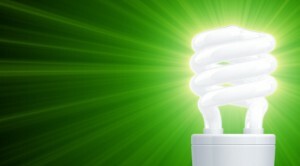 However, the benefits of CFLs to your energy bill and our planet outweight the risks in this writer’s opinion. We would love to hear your opinion of CFLs in the comments!